Most people these days have a presence on facebook and for the local aviation community it is no different, here are 2 pages and 2 groups I follow, which I think you will also like. On Wednesday evening after the ASX had closed Virgin Australia announced an earnings downgrade expecting its full year result to be lower than last year although still positive. The Virgin Australia share price fell eight cents to 38 cents on the news, wiping more than 17 per cent, or more than $200 million from its market capitalisation. The price and capacity war being waged between Virgin and Qantas in the domestic market has been the catalyst for the downgrade and has also impacted the profit forecast of Qantas. Qantas have announced that the 5 'new' Boeing 717 aircraft to enter their QantasLink fleet, operated by Cobham Aviation, will have Business class and will operate on Canberra routes to and from Brisbane, Sydney & Melbourne. "QantasLink will introduce a full Business experience on these aircraft, including market-leading seats, premium food and drinks and exceptional onboard service," Mr Gissing said. The 'new' aircraft are expected to enter service from late 2013 once the new interiors are fitted. 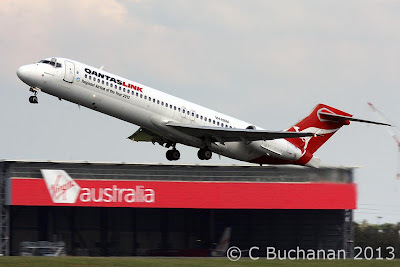 The new flights from Canberra will mark the return of the B717 to Sydney & Melbourne skies, after having previous been seen there in Impulse then Jetstar colours. The regional airliner was climbing past 9,000 feet when its compasses went haywire, leading pilots several miles off course until a flight attendant persuaded a passenger in row 9 to switch off an Apple iPhone. Inflight Wi-Fi systems are safe in part because devices connect to them at low power levels, according to Carson, who was co-chairman of an RTCA panel that produced testing standards. This is a touchy issue with most people and there will always be people who object to the official views of the regulating bodies and the airlines, but this issue doesn't look likely to be solved anytime soon, so its an issue that needs to be kept at the forefront of peoples minds. Laboratory tests have shown some devices broadcast radio waves powerful enough to interfere with airline equipment, according to NASA, aircraft manufacturer Boeing Co and the U.K.’s Civil Aviation Authority. Read the article for yourself HERE and see if you agree with the thoughts of the FAA/CAA/CASA/Manufacturers/Airlines or you agree more with some of the comments from readers. 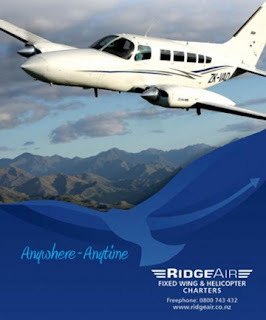 Ridge Air also advertise Robinson R44 ZK-HDD but this is owned & operated by Tasman Helicopters & used when required. I do not know whether these flights will operate from Woodbourne or from Omaka, or where they will operate from at Christchurch.